A little now river Krapinetz according to someone archaeologists in period 4th - 3th century BC are was navigable and is reach to Dunabe river. Winds in Isperich Municipality are changeable, but predominantly blowing from the West and Northwest. In summer they bring rainclouds of oceanic origin. 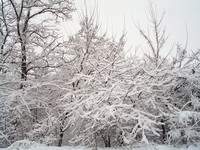 The Northeast wind is dry in summer and is a sign of stable and sunny weather and in winter it brings about severe cold and heaps the dry snow into snowdrifts. The water resources in Isperich Municipality are abundant since water is supplied from the great capped springs at Demir Baba Teke and the valley to the North of it, with the main one being Krapinez river. The largest group of wells was to be found to the South of the town over the present Isperich Railroad Station, with a depth of 19 m and clear water. 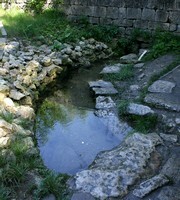 The spring near the village of Dragomaj has been capped to supply water to the town of Isperich and the village of Yakim Gruevo. There are a number of small water sources rich in fish on the territory of the municipality.